Mornings are Stella time. We have a routine now. She knows that when my alarm goes off at 6:30 am, it's time for an adventure. She comes onto the bed, stretches, and extends her paw in a handshake gesture. I dress for the morning ski, and then it's off to the slope of the day. We arrive, she takes care of morning business, and then falls into immediate tow behind me as I skin up. She doesn't go ahead and rarely even goes to the side – absolutely right behind. We get to the top, I rip skins, give her a hug to celebrate life and the summit and then it's off! Downhill. Today was cool. We had some new powder on top of hard pack, her absolute favorite. You could literally see her smiling as she took off in front of me, blasting through the new powder. Through the chute and there she was, smiling at me. We continued down, through the forest, until we came out at the truck. She sniffed around, while I change into street shoes, and then she gets a long rub behind the ears. We get home, and it's breakfast. On days like today I have to go to work, and on those days we do whatever it takes to make her as comfy as possible in the absence. She sleeps most of the day. In the evening, it's time for the pack to come back together. She howls and jumps on us (we're fine with that) and is just a happy puppy. On days off, it's always an adventure with her. I stopped nordic skiing this year mainly because Elaine and I wanted to spend our free adventure time with her. 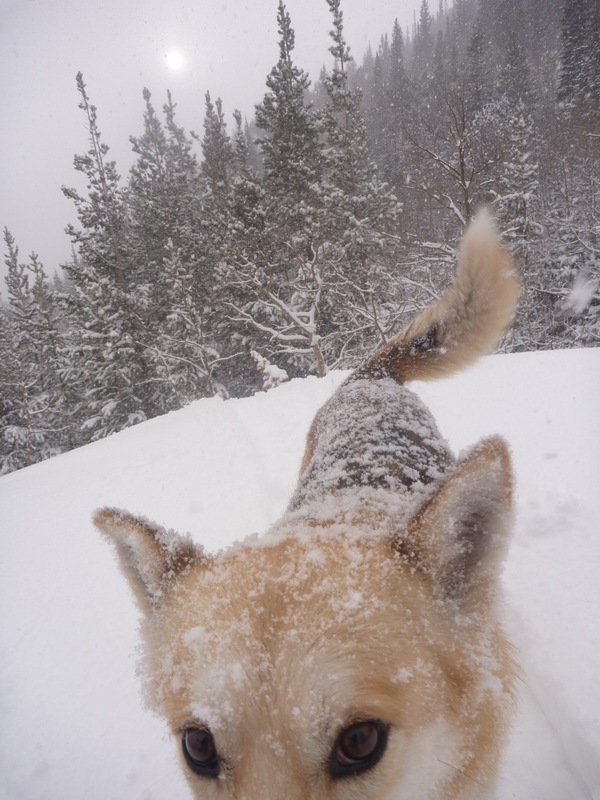 I'm well aware that these are the magic years – dogs live short lives and every day is precious – especially those where she can do things like skin up and ski down with me. Investing time in family – including pets – is something that is very important to me. I let one relationship in my life slip because I did not prioritize that enough. If we don't learn from our mistakes we are bound to repeat them. It was a good morning ski today. I'm a little run-down, but it's not bad. Day 90. Here is Stella, looking snowy and ready to shred the powder.